The explosive growth of the watercooling market has really surprised me. Only a couple of years ago it was regarded as far too extreme and risky for most people - even overclockers - to bother with. Since then, though, we've seen quite a few custom components appearing. There's a whole range of waterblocks, radiators and suitable pumps available for someone who wants to put together a watercooled system - I note that recently there's even started to be competition among the hose suppliers, with various products being advertised. Watercooling is still a niche within the larger niche of hardware enthusiasts, but it's definitely a growing one. 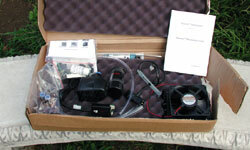 Perhaps the most dramatic indicators of watercooling approaching the mainstream is firstly that laptop manufacturers are starting to make products with tiny watercoolers embedded, but also, and more importantly, that there are now several complete watercooling kits available from some quite surprising companies. Asetek in Denmark can hardly be called conventional, given they've been for years now dominating the phase-change cooling market - that they pretty much single-handedly created - which involves strapping a fridge compressor to your CPU, with core temperatures reaching nearly -30C. Their Vapochill products (we reviewed the Mk2 Premium Edition here) are objects of unbridled technolust but are simply unaffordable for most people. So, it's no great surprise that they have turned to the less expensive and less extreme (and they are one of very few companies that can view it as such) watercooling market. Their first product is a complete kit called the "WaterChill". Water flows from the reservoir/pump to a radiator which cools it with ambient air. It then flows to the waterblock and is heated by the heat from the CPU. It flows back to the reservoir, carrying the heat away from the CPU. Back through the cycle it flows again, shedding the heat into the ambient air via the radiator. 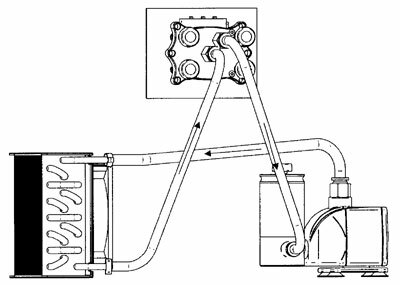 Note that Asetek advise a pump-radiator-block sequence of flow. The other option of course is to pump the water directly to the block to pick up heat, and then to the radiator to dissipate the heat before returning to the reservoir. Back in 1999 when I was first experimenting with watercooling I wasn't sure which way would be best, but if we assume the temperature of the water in the system rises initially and then plateaus at an operating temperature (assuming a fixed ambient temperature), then the point in the system where the water will be coolest is as it exits the radiator. It makes sense then that you want that water to immediately encounter the waterblock so the maximum temperature differential is experienced and the most heat can be carried away from the block. Asetek obviously subscribe to this theory also. Let's look at the components of the system in detail as we assemble it. The pump and reservoir are permanently joined together as a single unit. It's quite a bit heavier than I expected, because the bottom of the reservoir is actually metal. The lid of the reservoir can be removed and this is where you fill the system with fluid. 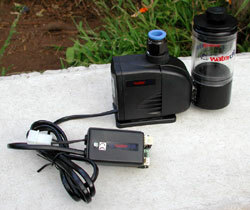 Note that the pump must be run vertically and that the reservoir is fixed in position and cannot be rotated. The manual says that these parts are glued together for sealing and you can indeed see glue where they join, but the reservoir on the review unit was able to pivot around the joint to the pump. However, I kept it oriented correctly and no leak was observed in this area during testing. The pump itself is a Hydor L20 and claims max flow rate of 700l/hour and a max head height of 135cm. The outlet is of course via the top connector, which is a 12mm fitting. 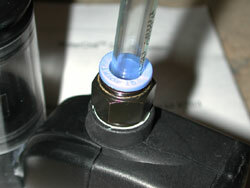 Note the quick-use connectors - you push the blue ring down to allow the tubing to be inserted or removed. These connectors had me worried at first, because there's no way to wrap a cable-tie or hose clamp around them to tighten them up if you, like me, are paranoid about leaks. However, they do seem to seal very well while still allowing easy installation and removal, so I can't really complain. One outstanding feature of this pump is that it's very quiet. Four suction-cup feet are provided to secure it and isolate vibration from your case. I doubt most people will even notice the operating noise of this pump at all. One thing to note about this pump is that the casing gets quite warm when it's been running for a while. Whether this adds enough heat to the system to compromise performance is something we'll see later. Also, you will need to make sure the reservoir is kept quite full. The pump is powerful enough to create a vortex in the reservoir and if the water level is too low, this vortex will reach down into the pump inlet and bubbles will be pumped through the system.